I'll confess that while my first and only class on Kumihimo was really about how to add beads to the braid, it took me a few months of just braids, reading and research before I committed to an all bead braid. 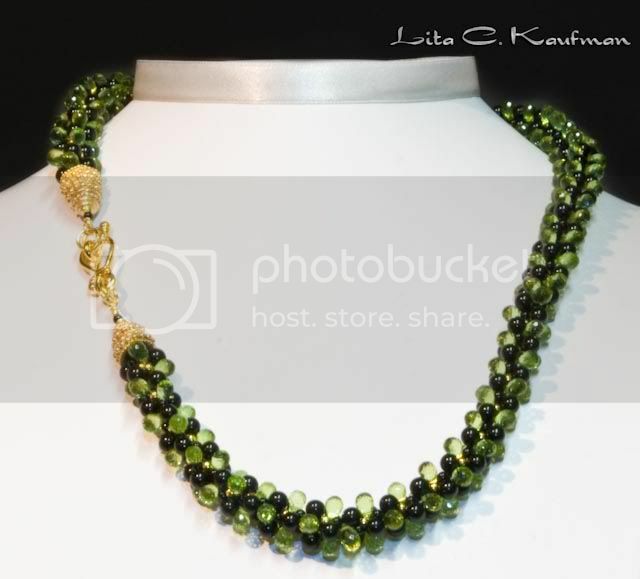 The green braid I posted for the Green/Yellow challenge on Beading Daily was my first effort with an all-bead braid. What astonished me was how quickly the braid grew - completely out of proportion to how long it took me to string the beads onto the SuperLon. This piece was where I learned that using SuperLon was not really the best material - while the size 8 beads had nice sized holes, the thread was just too heavy to get through doubled on a Big-Eye needle, which meant that I needed to string a few hundred beads onto eight strands one by one. That took about 6 hours - but it only took about 2 hours to actually complete the braid. I also had a bit of a mess when I was laying out the strands - I hadn't bobbin'd them - so everything got messed up and it too several hours to get the dratted strands unknotted. I strongly recommend using the following procedure - string your beads and spool everything onto bobbins (more on that later, leaving just enough thread on each side of the middle to get the thread mounted in the loom slots) as you work - don't leave the winding until after you've got everything strung. Centrifugal force is NOT YOUR FRIEND, and you'll end up with a tangled mess. Okay, enough with the basics. On to the beads! 1 - Getting the beads onto the braiding strand. When you use natural materials such as pearls and stones, you're very likely to encounter uneven and very small holes. This is where the choice of braiding fiber is important - you've got to plan for the smallest hole in your bead selection, otherwise you're going to spend a lot of quality time with broaches and reamers. The worst were the nearly microscopic holes in these peridot drops. I was warned when I purchased them that the holes were even but extremely tiny - and if I forced the thrread, I would likely crack the bead. So, I sat with my halogen desk lamp turn up to solar flare strength and threaded several hundred drops onto Fireline without a needle. I had to keep dipping the end of the Fireline into a tube of KrazyGlue to make it stiff. This was an instance where having very very fine Beadalon or Softflex would have worked better, but I actually think the holes on the peridot were too small even for that. 2 - Having Enough Beads. This can be a big problem, especially for a longer necklace. I'm not terribly good at math, but if I was, I could probably figure out how many beads I needed for each inch of length on the finished braid. It's not as simple as counting how many beads on an unbraided inch, since the beads both nestle and turn at an angle. To be honest, most of the time I just wing it. When I'm working in all pearls, I always use eight full strands - one for each strand on the braid. I usually try to buy nine strands of the same pearls, so I have extra. 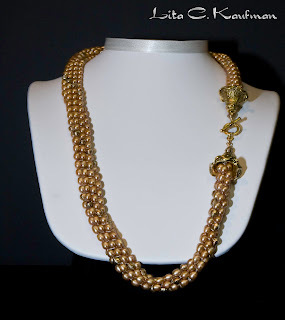 This one is made from 6 strands of gold potato pearls - the temp strands were 12 inches. The finished piece is close to 20 inches. 3 - The Wrong Type of Beads. Yes, there are beads that should not be part of a braid. First are those are beads that are liable to cut through the strand fiber. That means that unless you're going to use Fireline or a coated beading wire, heavy hollow metal beads and crystals are not a terribly good idea. Even if the crystal beads don't cut the thread during the braiding process, there is a strong possbility that they will while wearing. 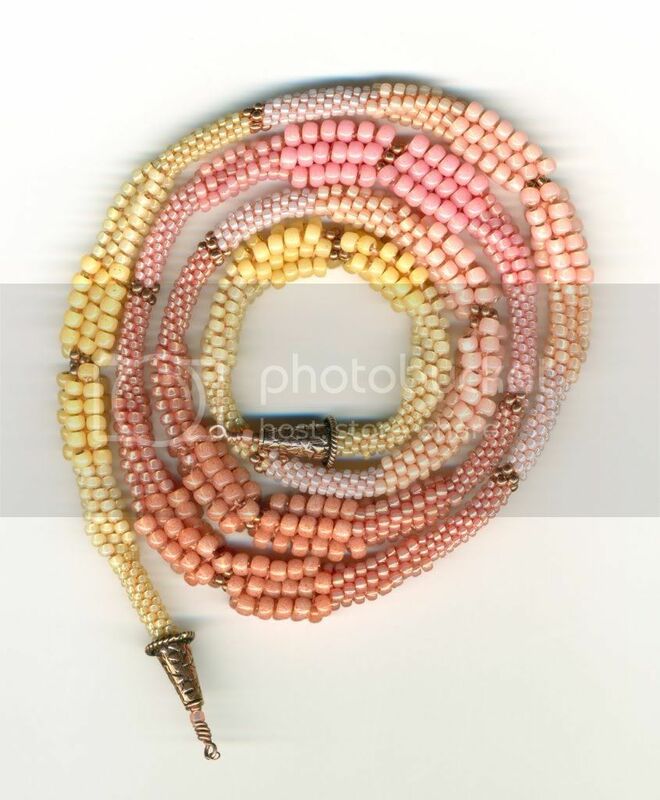 Other beads you may want to avoid, particularly when first learning, are bead with an uneven or assymetrical shape. During the braiding process, the beads have to catch at a certain point among the strands - I call it "tucking" - and an irregularly shaped bead may be difficult to keep tucked. If it doesn't stay tucked, it will pop inside and the braid will look wrong. I am sure that there are other cautions, but these are the big three. One comment my teacher made about using beads on all eight strands, or on more than four strands, is that you don't see the braid for the beads, and it looks more like crochet than kumihimo. My reply is "so what?" 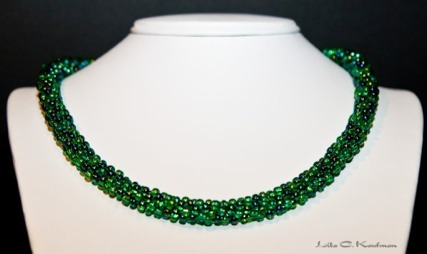 You can play with pattern, shape and color with beads just as you would with different stringing materials. The variety is truly infinite, and you may find yourself completely surprised by the results. The way the finished braid looks is greatly dependent upon how you've set up the beads (or the color) initially. If you're using all the same beads, of course the order of the braid doesn't matter, but if you've got multiple colors or shapes you are going to want to pay attention to the initial set up. I strongly recommend getting a copy of Anne Dilker's Braiding for Beaders, which has a layout of the possible colorways for 8-strand braids. This is also an awesome book on how to get started. As I noted earlier, Anne Dilker was my instructor. About being surprised by the results - sometimes there is really no predicting how a pattern will work out. I was experiementing with a relatively small quantity of vintage pink satin glass beads - two sizes of drops, in combination with two strands of 2.5 mm and two strands of 4 mm black onyx and I ended up with a completely square braid! The onyx and peridot braid above has a natural spiral to it (because the fireline was so much lighter than the black silk, it pulled tighter, creating the twist), but this pink and black "thing" is like a long, retangular log. 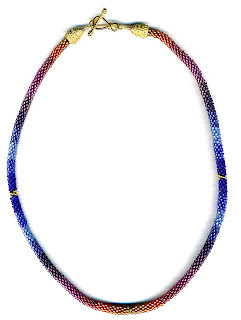 Pattern can be achieved in the use of color with adding beads to a strand. But this means counting carefully - it's following a pattern EIGHT TIMES. If you're off by one bead, it can be a big deal - and mean that you have to restring an entire strand. Or not, if you don't care. This rainbow was achieved by simply putting the right number of size 11 seed beads for each color, plue one vermeil bead as a break. It was definitely tedious, and I had to redo strands several times since I kept obsessively checking the pattern along each of the eight strands. This one was not as successful - I was playing with both color and size, and at a certain point I was off by 1 or two beads, which means that the little copper bead "breaks" were off (although you can't see it in this scan I know that it's not perfect). To fix some of the more obvious problems, I actually had to break off some of the seed beads. After all there's something like this necklace available to suit every style. And the fun is that with it's amazing affordability, you can never say no.